Making progress on tackling health inequalities is not just about getting the right evidence – it means challenging power, shifting culture and changing how we work. In order to do this we need a clear narrative – a story – that empowers champions, motivates the undecided and challenges the unconvinced. We have struggled to do this – for example a decade ago it was a real success when we started to talk about differences in life expectancy between socio-economic groups by using examples that many people are now familiar with the such as the bus journey/bus stop analogy. feels very far off – it does not feel sufficiently urgent to decision makers and service providers. as a measure does not reflect the profound impact that long term inequality has on health and wellbeing – it simply does not bring you into the room to feel the day to day life of living in circumstances of financial insecurity, poor housing etc. a short life can still feel to be a relatively small part of someones total life years and therefore may feel as though it is not a very big deal to some people. In recent times thanks in significant part to the Institute of Health Equity and other players such as the Health Foundation we are seeing a shift to focus more on the impact of health inequality on Disability Free Life Years and multimorbidity. Table from Epidemiology of Primary Care (2018) by Anna Cassell, Duncan Edwards et al. 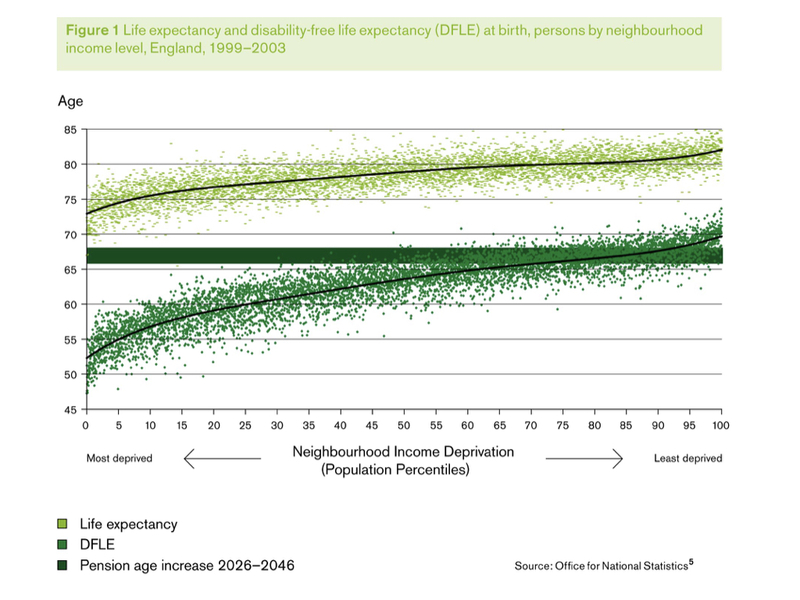 The graph below from the Institute of Health Equity shows how people who experience socio-economic inequality are likely to have a shorter period of disability free life expectancy than people who are wealthier and to already have poor health before they reach pension age. 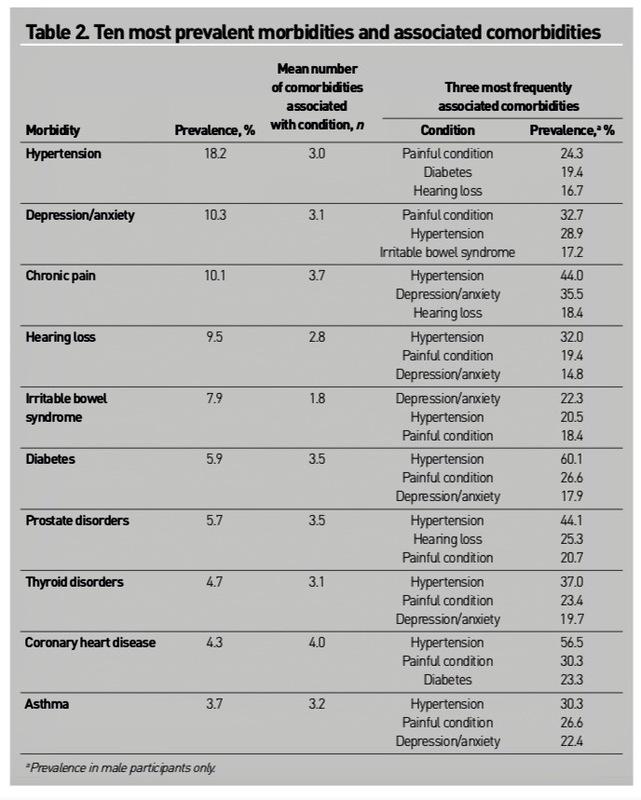 speaks directly to the NHS – in particular primary care (as is shown by this useful recent study in the British Journal of General Practice) because many of these conditions are amenable to clinical treatment. motivates local commissioners because there is a relationship between multi-morbidity and use of urgent care. opens up a debate about the role of the social welfare system and how the NHS connects with it because they both have a role in helping people live independent lives when they experience disability and illness. Of course focussing on multi-morbidity does not in itself solve health inequalities – however it does challenge the NHS, make it clearer what it’s contribution can be and pushes health services to make stronger connections to agencies working to address the social determinants of health. ← The end of Clinical Commissioning Groups? Thanks for this Mark. It provides a very bio medical perspective, a single story on how people are living with and inheriting inequalities impacting on health, wellbeing and life opportunities more generally. Your comment on life expectancy data “was not sufficient to mobilise and sustain action at a local level” – what would be sufficient to generate a shift in resource, leadership and action? I’m wondering if that needs to come directly from people locally living with such intolerable issues – direct lobbying and protest toward those that control resources and have authority to act? Exposing the unacceptable. My other reflection comes from a tweet comment – that part of the real turn of the dial is embedding a health promoting culture and actions akin to Antonovskys salutogenesis model in the local systems – maybe that’s the real deal across time. To para paraphrase from our colleagues Dr Lynne Freidli’s writting on Public Health interventions….what we’ve done hasn’t worked. So…. As you would expect I agree with both of your points – local accountability and pressure and greater focus on salutogenesis. However, the blog focuses on just one part of the picture – the role of the NHS and in particular general practice. I think that in the NHS there is still a reliance on a few GPs and commissioners who are trying to do practical work on health inequalities. We lack a systematic approach among the bulk of clinicians and at the heart of this is the lack of narrative that we can use to try to bring more on board – hence my arguing that multi-morbidity takes us forward – it does not solve this – just takes us forward. By developing this narrative I think it also gives local activists (like me and thee) something to challenge local systems on. Second with regard to your second point I think to a large degree the same issue applies with regard to advocates for a more inclusive Antonovsky led approach – lots of examples of good practice but few examples of systematic approaches – in particular a lot of voices shouting into the wine (nothing wrong with that) but a lack of a theory of change! …..but of course you and I are on with trying to address this!